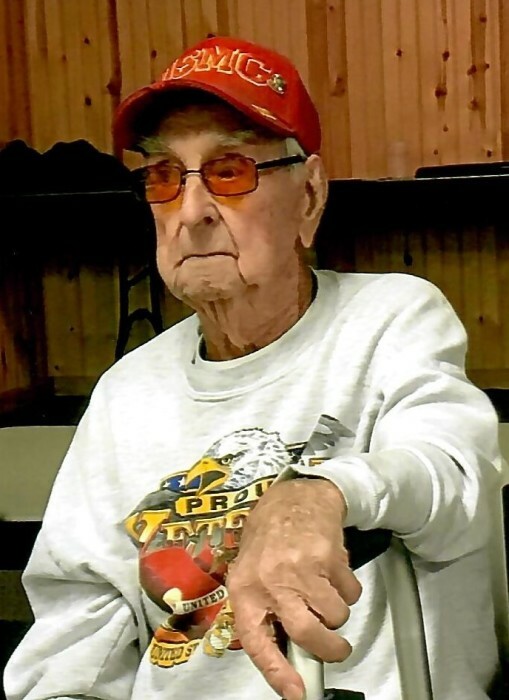 Harry Junior Ostrom, 95, Hays, died Saturday, March 23, 2019 surrounded by family at his home. He was born July 1, 1923 in Hays the son of Harry and Dorothy M. (Joy) Ostrom. In 1942, he enlisted in the United States Marine Corps serving two tours in the Pacific Area as a searchlight crewman and power supply mechanic during World War II. He worked in the construction business for Pierce Schippers Construction, retiring in 2005 at the age of 82. On April 15, 1950 he was united in marriage to Carol Morris in El Monte, California, a union which would span nearly 69 years. He was a member of St. Michael’s Episcopal Church, and the VFW, American Legion, and Marine Corps League. Harry enjoyed gardening, planting trees, woodworking, and family and family reunions were very important to him. He was proud of his U.S. Marine Corps service, was very kind and gentle hearted, and he never held a grudge or knew a stranger. Survivors include his wife, Carol of the home in Hays, four sons; Harold Ostrom and wife Kathy of Hays, Gary Ostrom and wife Debbie of Hays, Jon Ostrom of the home in Hays, and Jeff Ostrom and wife Andromada of Hays, a daughter; Dorothy Renninger and husband David of Titusville, PA, two brothers; Steve Ostrom and wife Laura of Hays, and George Ostrom and wife Pat of Natoma, two sisters; Marilyn McMillin of Richmond, KY, and Edith Ward and husband Steve of Ellis, eleven grandchildren; Timothy and Kristina Renninger of Warren, PA, David and Paula Renninger of Grove City, PA, Tasha Ostrom of Hays, Renee and James Meis of Hays, Gina Olivo of Colorado, Jerred and Brandi Ostrom of LaCrosse, Chris and Tressa Matal of Meriden, KS, Brian and Cookie Matal of Topeka, Shannon and JC Ramos of Fort Drum, NY, Gavin Braun of Hays, and Kyle Ostrom of Hays, fourteen great grandchildren and three great-great grandchildren, a family friend; Ron Bradshaw of Topeka, cousin; Velma Baker of Hays, his two four-legged family members; Charlie and Trouble, and numerous nieces and nephews. He was preceded in death by his parents, a daughter; Elizabeth Prator, brothers; Orton Ostrom, Kenny Ostrom and infant brothers John and Robert Ostrom, a grandson; Joey Matal, and great grandchildren; Lindsey and Luckas Matal.